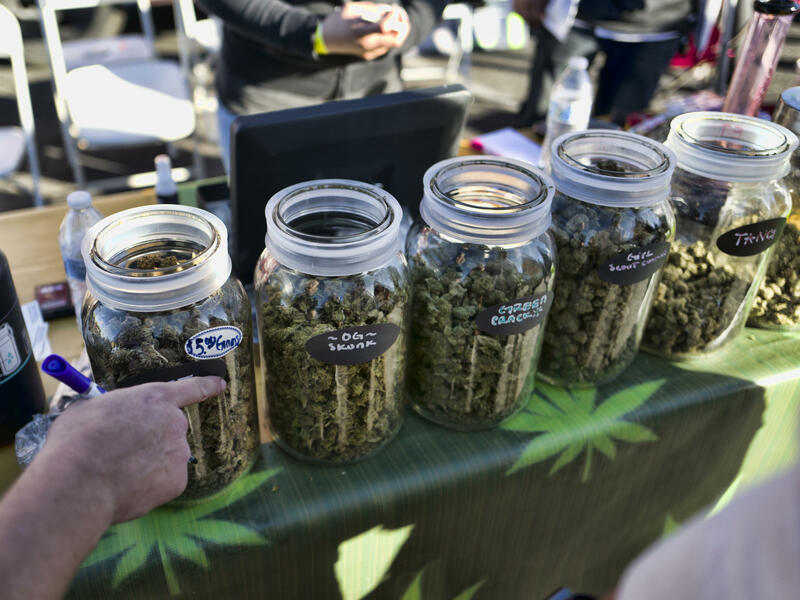 A vendor points to a selection of cannabis strains for sale during a 2018 marijuana festival in California. San Francisco officials plan to expunge more than 9,000 marijuana convictions dating back to 1975, the city's highest law enforcement official said Monday. It's the culmination of San Francisco's year-long review of past convictions after California voters legalized recreational marijuana throughout the state in 2016. Several California cities are taking on the task of expunging records, but San Francisco is the first one to finish the job, the San Francisco Chronicle reported. "It was the morally right thing to do," San Francisco District Attorney George Gascón told the Los Angeles Times. "If you have a felony conviction, you are automatically excluded in so many ways from participating in your community." Gascón said his office would expunge 9,362 felony and misdemeanor cases. That includes 1,230 his office had already cleared. Before the city started to comb through records to find those eligible to be cleared, only 23 people had petitioned the city to do something about their convictions, NPR reported last year. That's because the process was tedious, Gascón told NPR's Ari Shapiro. "You have to hire an attorney. You have to petition the court. You have to come for a hearing," Gascón said. "It's a very expensive and very cumbersome process. And the reality is that the majority of the people that were punished and were the ones that suffered in this war on marijuana, war on drugs nationally, were people that can ill afford to pay an attorney." With a marijuana conviction on their record, Gascón said, people sometimes face difficulty getting loans and public assistance. The city's proactive approach was an attempt to help people who "most need the relief" but either "can't afford it or would not know how to go about doing this," he said. Gascón's office also noted racial disparities in marijuana arrests, NPR has reported. For instance, by 2010 and 2011, African-Americans only represented 6 percent of the city's population but comprised about half of its marijuana-related arrests. Gascón said San Francisco was "taking the lead to undo the damage that this country's disastrous, failed drug war has had on our nation and on communities of color in particular." Not everyone is happy. John Lovell, legislative counsel to the California Narcotic Officers Association, told the Times: "To simply embark on an across-the-board expungement of 9,300 without looking at any of the surrounding factors on any of those cases strikes us as cavalier irresponsibility."